Hotel Merlin, Lozenets - снимки, цени на стаи, карта, описание на услуги и удобства, телефони за връзка. Hotel Merlin and its complex are located in an enormous park with 6 000 sq. m. in size. The complex offers a multitude of various services, splendid accommodation conditions, quality cuisine and impeccable service. Everyone will take delight in the seclusion and open spaces of the complex, the boutique decoration of the rooms and the magnificent atmosphere achieved through combining different natural materials and metal. Hotel Merlin is the perfect place for a vacation at the sea side. Hotel Merlin can accommodate its guests in 22 double rooms, situated in the main building of the hotel, 8 private apartments, situated in the Villas a la Maldivi and 12 family studios, located in the brick twin-houses. All rooms, apartments and studios are bright, spacious comfortable and well-appointed with boutique furniture. In the large park of the complex there is a guarded parking, two open-air swimming pools called Eye and Sea Blue, each with a section for children. There is also a special children's playground for the youngest guests of the hotel. The complex has a games room for billiard and darts as well as a special room for beauty and relax massages. For those who don't want to lose their good shape and tone during their summer vacation, the hotel has provided professionally equipped gym. Restaurant Garden offers superbly prepared dishes from the Bulgarian and European cuisine served in an exceptionally cozy and stylish atmosphere. The team of the restaurant gives its best to provide various daily menu and organizes special culinary nights dedicated to different cuisines from around the world - Chinese, Greek, traditional Bulgarian. The nourishing hearty breakfast is served on a block table in the garden. The menu comprises of different vegetables and fruits, home-made pancakes and biscuit cake, various kinds of cheese and cold cuts. The restaurant is located next to the Sea Blue swimming pool. On this territory is provided wireless internet connection. Next to the Eye swimming pool is situated the Barbecue Bar of Hotel Merlin. Besides selected alcoholic and non-alcoholic beverages, it serves exotic cocktails and superb grilled on charcoal meals. The atmosphere is relaxing and predisposes to complete rest and peacefulness. On the territory of the Barbecue Bar are organized thematic nights full of joy and positive emotions for those who love quality cuisine, cocktails and music. The double rooms of Hotel Merlin are situated in the main building of the hotel. All of them have an air conditioner, TV set with cable television, telephone, mini bar, sofa, wardrobe, desk, chair, private bathroom with shower and a bath tub. The furniture of the rooms is boutique, which brings a pleasant difference from the standard hotel style. The beds are from wood and metal and have comfortable ergonomic mattresses. 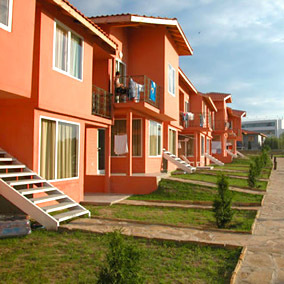 The eight apartments of Hotel Merlin are located in the villas of the complex. The four villas form a semi-circle around one of the swimming pools. Each of them has two separate apartments. The apartments have private entrances on opposite sides of the villa. They are luxuriously and comfortably furnished and have their private veranda, living room and a separate bedroom. The furnishing includes a double bed, wardrobe, desk, dining table and chairs, sofa. The apartments have an air conditioner, TV set with cable television, telephone, mini bar, private bathroom with shower and a bath tub. The family studios of Hotel Merlin are situated on the second floor of the brick twin-houses arranged in a row. The studios have one double bed and one or two single beds. dining table with chairs, wardrobe, desk, air conditioner, TV set with cable television, telephone, mini bar, terrace with a view of the pool, private bathroom with shower and a bath tub. On the first floor of the twin-houses are located double rooms. They are suitable for families with small children and elderly guests because there is no need to climb any stairs in order to reach the room. These rooms have an air conditioner, TV set with cable television, telephone, mini bar, private bathroom with shower and a bath tub. Their furnishing includes a double bed, an extending couch for children up to 12 years, wardrobe, desk, chairs. Lozenets provides excellent conditions for water sports like surfing and kite surfing, hunting and fishing. There is a surf school there and annually it organizes surf competitions. Usually the first week of September is dedicated to the surfers. In Lozenets there are plenty of opportunities for active rest. You can play tennis, ride water wheel and jet, take a walk on the eco paths of the Strandja mountain, take safari tours, ride horses and do plenty of other interesting things. Hotel Merlin is located in Lozenets, municipality of Tsarevo, at 70 km from the international airport Bourgas on the E 87 road. The beach is only 300 m away from the hotel and the centre of the village is 200 m from Hotel Merlin. Double Room 22 56.00 - 84.00 lv. Apartment 8 50.00 - 80.00 lv. Family Studio 12 40.00 - 70.00 lv.